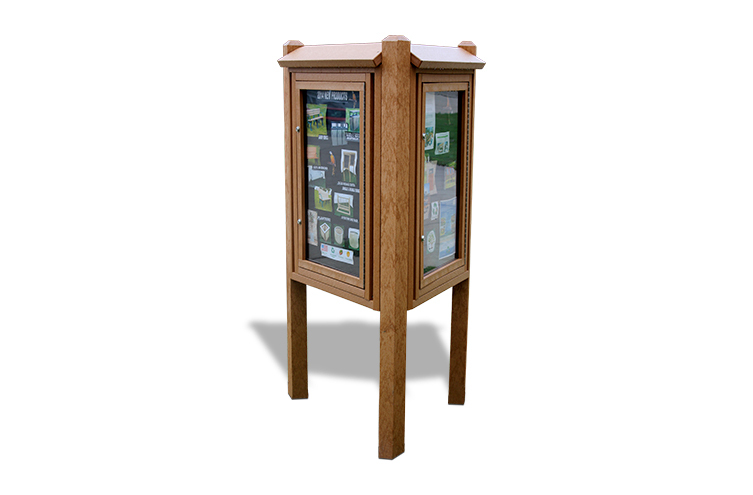 Display menus, posters, message or advertisements with this recycled plastic menu enclosure. Windows are made of a polycarbonate material that is scratch and break resistant. Recycled rubber tackboard lined doors last longer than cork and are weatherproof and washable. Constructed of commercial quality, eco-friendly, maintenance-free recycled plastic and stainless steel hardware adding strength and durability for many years of use. 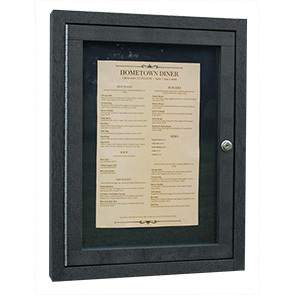 This menu enclosure can be wall mounted vertically for stability. All hinge fasteners are internal, eliminating chance of screws being removed by vandals. Weather resistant keyed barrel lock. Scratch and shatter resistant polycarbonate window is safe around kids and provides much better scratch protection than acrylic.